The State Government has launched a Local Content Program across regional Western Australia to maximise the participation of regional businesses in regional contracting opportunities. Recognising that it can often be challenging for businesses to access and engage as a supplier to government, Local Content Advisers have been appointed in each Regional Development Commission to take a lead role in promoting supply and works opportunities and facilitating regional business capability and growth. The Peel Local Content Program commenced in May this year. Over the past six months the Peel program was developed and refined through extensive stakeholder engagement to ensure the activities both enhanced the strengths and addressed the challenges faced by businesses in the region. Supporting local businesses build their capability and competitiveness to win more contracts is a crucial program focus. This includes connecting businesses to the myriad of procurement opportunities and preparing businesses to engage as a supplier of works or services to government. Businesses winning work ultimately has a positive flow on effect for our community. Results in more jobs for local people and more businesses being in the position to take on apprentices and trainees to support the development of our youth in the region. By no means is this an easy feat and the Peel local content program cannot be delivered alone. There are many stakeholders who contribute to the delivery of these outcomes for our businesses and community. Partnerships with key groups such as local governments across Peel, the Peel Chamber of Commerce and Industry, Federal Government initiatives such as Austrade and the Mandurah/Murray Employment Facilitator, and the State Governments WA Jobs and Skills Centre all play a key role. This collaborative model demonstrates the regions strong commitment to diversifying the region’s economic base, the growth of business and entrepreneurship and the attraction, retention and development of a skilled workforce for our Region. 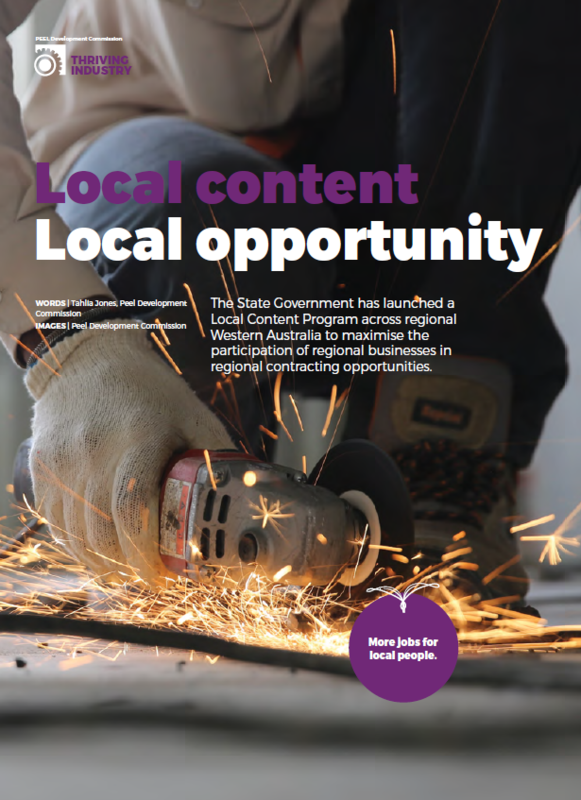 The local content program is underpinned by the State Governments Western Australian Jobs Act 2017 (WA Jobs Act) and the Western Australian Industry Participation Strategy (WAIPS) which came into effect on the 1 October 2018. This legislation puts greater responsibility on State Government agencies to provide local businesses with full, fair and reasonable opportunity to access and win government supply contracts. The WA Jobs Act is the first piece of legislation of its kind that applies to State Government agencies. A key component of my work is to support government agencies with the implementation of the WAIPS to their procurement cycle to ensure that opportunities for local business to participate are maximised. The Peel Business Park was one of the first projects in regional Western Australia whereby the WA Jobs Act and the WAIPS was applied to the procurement process. This presented an excellent opportunity to work in collaboration with lead project partner LandCorp to design a process with a strong, long term focus on engaging Peel businesses and the community over the life of the project. Through the design of the new approach, the concept of a Peel Business Park – Peel Based Business Register was delivered for the region. Over 100 businesses in the region registered their business details, including Aboriginal businesses. The Peel Based Business Register demonstrates an excellent example of regional business engagement. Another area of focus for Peel, is fostering the development of Aboriginal businesses in the region. In August the Peel Development Commission delivered an Aboriginal Business Development Forum which provided an opportunity for Aboriginal business owners to learn more about how they can access government procurement opportunities and get practical support for growing their businesses. The event brought together over 40 people to hear from a range of support services including Indigenous Professional Services, the Mandurah/Murray Employment Facilitator and myself to showcase a range of supports available for Aboriginal businesses across Peel. The forum was an important first step in providing opportunities for networking amongst business owners and raising awareness of the Aboriginal Procurement Policy and the opportunities it presents, as well as the support mechanisms that are available. When our Indigenous business sector is supported in its growth and development, our entire region benefits.